If you have been following me for a while or have experienced a healing session with me, then you know oracle card decks are my favorite spiritual tool. Owning my own decks and using them every day was a huge part of my personal healing and developing my intuition. I always pull cards for myself in the morning for daily guidance or when I need some inspiration when working through something. I have learned so much from my card decks over the years, but most importantly, I’ve learned to trust my intuition. For example, I will say something to a friend or write something in my journal and then later I pull a card that has the exact same wording as what I said. This serves as validation to me that I am on the right track and always supported. I now use them at the end of my Spiritual Direction & Energy Healing sessions to further validate for my clients that the guidance I have channeled for them is directly from their Divine Team. It’s such a special moment when a card flies out of the deck while shuffling and my client sees it and is shocked, happy and reassured. I use this deck every single session when working with clients. It is my absolute favorite for many reasons. Not only is it visually stunning, but I feel that it has a card for every message I could ever possibly need. It includes all the elements, seasons, animals, angels, ascended masters and more! The descriptions in the book are also spot on, profound and beyond inspiring. This deck is probably one of my most prized possessions; I’m not exaggerating, I love it that much. This is a perfect card deck for those that are just starting out exploring cards as a tool. It is another deck from Kyle Gray. It is very uplifting, and I love that it features messages from Ascended Masters and Archangels. In addition to being beautiful, it is very educational. Any time I use this deck I feel directly connected with the masters. If you are ready to go deeper, this incredibly powerful deck is for you. Each card has 2-3 pages of lengthy guidance PLUS a healing process with each one which includes affirmations, prayers and/or visualizations. Basically, this deck means business. I use it for myself every single day. I like to pretend it’s a therapist in card deck form. This card deck is probably the most beautiful I’ve ever seen. Not only is it aesthetically stunning, but the messages are profound and feel very very sacred. This deck is an amazing tool if you’re wanting to understand your life’s purpose. There are 5 types of cards: Confirmation, Inquiry, Action, Activation and Transmission cards. The guidebook really teaches you how to deepen your relationship with your soul. I also love the guidebook activations and exercises. This card deck is all about tapping into your Divine Feminine Power, and it features different goddesses and female ascended masters. The cards are very to the point making it a great deck to use if you’re starting to offer intuitive readings for others and want visuals to help guide the messages you are channeling. It’s also a great way to learn about Goddesses + Ascended Masters. So there you have it, my 5 favorite decks that I use personally and in session! If any of the decks draw your attention and you’ve been looking to connect more with your intuition, trust your gut. 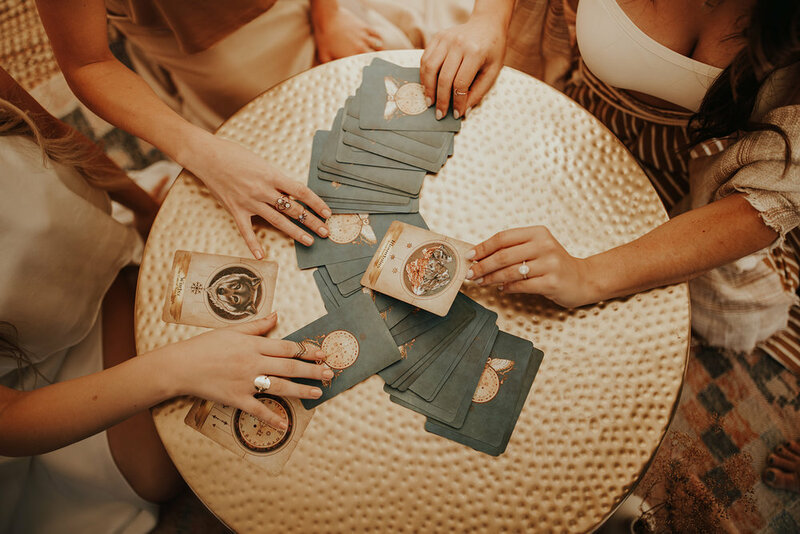 If you already work with oracle or tarot card decks and have one you love - comment below, always looking to grow my collection :) If you have any questions about working with your card deck, comment below - I’ll answer them in a future blog or video! If you are interested in experiencing a Spiritual Direction & Energy Healing session with me, click the button below for all new client specials and pricing. On Route 44 is a participant in the Amazon Services LLC Associates Program, an affiliate advertising program. On Route 44 earns commission when you click through any of the Amazon links provided. Thank you for the support!